Starting this Thursday (November 22), Reporter’s Notebook presents a three-part special on Scarborough or the Panatag Shoal. Just last May, Chinese Coast Guard were caught on a video seizing the best catch of Filipino fishermen in the disputed water. Five months after the local fishermen reported about this incident, the Chinese Coast Guard were said to be no longer getting any part of their catch. But Reporter’s Notebook learned that the Chinese Coast Guard are still patrolling the area and have prohibited anyone from documenting their activities. “Without the permission of China, you cannot carry out the interview activity here. Okay? If you don’t leave here, we will treat you in a force manner.” This was the direct statement given by an official of Chinese Coast Guard to the Reporter’s Notebook team when they tried make a follow-up story on the Filipino fishermen on Scarborough Shoal. 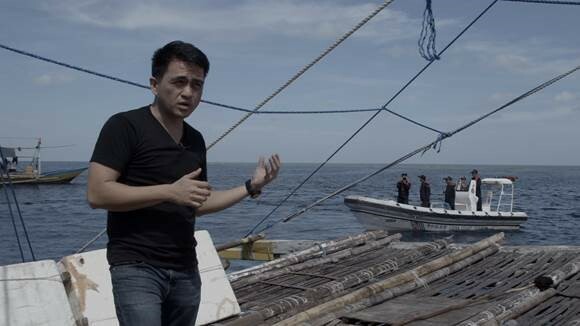 “The sea area of the People’s Republic of China.” This is how the waters of Scarborough Shoal were described to Jun Veneracion by the Chinese Coast Guard officer he met. But the Scarborough Shoal or o Panatag Shoal—which is found 124- nautical miles from Masinloc, Zambales—is part of the Philippines’ 200-nautical mile Exclusive Economic Zone o EEZ. Some experts on maritime law say that what Reporter’s Notebook caught on video was China’s way of showing “possession and control”. But if one will follow the international law, experts say China should not claim the waters surrounding the Scarborough Shoal. Meanwhile, Maki Pulido trails the arrival of Chinese President Xi Jinping who is expected to sign the agreement between Philippines concerning several projects to be funded by the loans from China. Will the issues on the disputed West Philippine Seas be discussed? Don’t miss the first part of the special report “Batas Ng Karagatan: Pagbabalik Sa Scarborough” on Thursday (November 22) in Reporter’s Notebook, after Saksi on GMA 7.